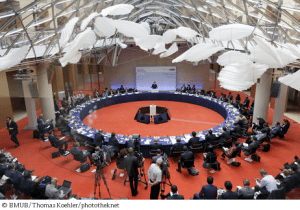 Ministers from some 35 UN member countries gathered in Berlin last week for the fifth Petersberg Climate Dialogue, aiming to pave the way forward to a multilateral climate treaty and successor to the Kyoto Protocol. Germany hosted the conference along with Peru, where negotiators are to meet this December at the UN Framework Convention on Climate Change‘s (UNFCCC) 20th Conference of Parties (COP 20). German Chancellor Angela Merkel demonstrated Germany’s commitment to strengthening and picking up the pace of international climate change mitigation and adaptation initiatives by pledging to contribute €750 million (~US$ 1.01 billion) to the UN Green Climate Fund (GCF), whose remit is to assist developing countries carry out greenhouse gas emissions (GHG) reductions and move forward with socially and environmentally responsible economic development plans. Germany’s is the first national commitment to the GCF, which is in fund-raising mode on the way to becoming fully operational. To accomplish this, the GCF is looking to the 195 UN countries party to the UNFCCC to contribute a total of $10 billion. Looking ahead to the Lima Climate Change Conference in Peru this December, Chancellor Merkel also called on world leaders to take stronger, more aggressive action to combat climate change, and do so in ways that can stimulate economic and social development while protecting increasingly threatened ecosystems and natural resources. Registering healthy growth while transitioning to a more distributed, low-carbon energy infrastructure, the German experience vis-a-vis the institution of climate change mitigation and adaptation policies and initiatives demonstrates that economic growth and business competitiveness need not be sacrificed on the way to developing low-carbon societies. In Peru, UNFCCC negotiators aim to hammer out the final details of a draft text for a global climate treaty to be adopted in 2015. That includes a successor to the Kyoto Protocol and within which UNFCCC parties have made commitments to reduce greenhouse gas (GHG) emissions. UNFCCC countries have agreed to present national strategic climate change action goals and plans at COP 20 in Peru this December. A final version of a new UN climate treaty – to enter into effect in 2020 – is to be put up for adoption in 2015 at COP 21 in Paris. “Before the 2015 Climate Change Conference in Paris, we must make sure that the effort is shared equitably and that the actions proposed are sufficient to limit the temperature increase to below two degrees,” Hendricks added, pointing out that Germany is well-prepared for the debate. Germany has set a goal of reducing national GHG emissions 55 percent compared to 1990 levels by 2030. More broadly, within the EU, Germany is supporting adoption of a goal to reduce GHG emissions throughout the 28-member region by at least 40 percent by 2030.